In 1997 Friends and Drake High School students planted the first oaks in our restoration project along Sleepy Hollow Creek, on the school campus. a landslide. 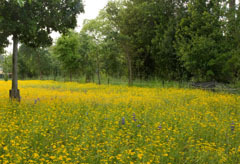 We planted 13 species of trees, 25 species of shrubs and vines, and 24 species of grasses, sedges, ferns and forbs. Approximately 180 native and non-native plant species have been observed, including the showy native broomrape (Orobanche vallicolaa spp. ), last reported in the Ross Valley in 1924. Alders planted in 1997 are now over 45 feet tall, and luxuriant willows too have transformed the creek environment into a habitat nurturing much more diverse wildlife. Friends continues to maintain the project. Funding was provided by the Marin County Stormwater Pollution Prevention Program. The nearly 20-year-old trees planted by students are visible from Sir Francis Drake Boulevard. 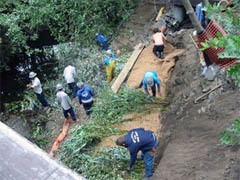 In October 2006 a crew from the Marin Conservation Corps (now Conservation Corps North Bay) replaced riprap and invasive plants with willows and dogwood, using a design for brush layering by Prunuske Chatham Inc. The layering included willow, which prefers a sunny site, and dogwood, a more shade-loving plant, as insurance against variable amounts of sun. The Conservation Corps crew returned in 2006 and 2007 to remove more cape ivy, giant reed, French broom, fennel, and vinca, making room to install over 200 plants representing 20 species. These plants were installed both upstream and downstream of the brush layering. Big-leaf maples, buckeye, coffeeberries, and toyons planted by the Conservation Corps add to the alders, ashes, and willows that were already growing along the creek. 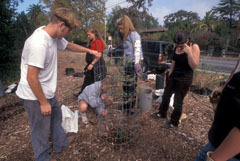 Smaller plants installed by the Conservation Corps included vine honeysuckle, sedges, rush, sticky monkeyflower, snowberry, woodwardia, and ceanothus. Over the years, drought and lack of maintenance by the Town have taken a toll and most of the smaller plants did not survive. Conservation Corps North Bay crew builds brush layering. Photo by Prunuske Chatham Inc.
Funding was provided by MCSTOPPP, State Water Resources Control Board Proposition 13 Bonds, and Ross Valley Sanitary District. The Town of San Anselmo provided water for initial irrigation.